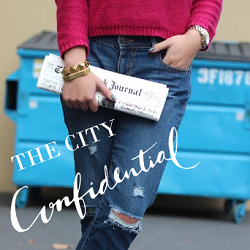 The City Confidential: Happy 20 Something (To Me)! Happy 20 Something (To Me)! Today's my birthday and I plan to surround myself with people (and food) that I love! Since I get all sentimental on birthdays, I was randomly reminded of a letter I wrote to myself when I was 16. I bedazzled it with glitter glue, rhinestones, and stickers and sealed it with a note that stated "DO NOT OPEN UNTIL YOU'RE 21." I opened it a few years ago and was astounded by the wisdom my 16-year-old self had to offer. This was one of my favorite lines: Never lose your childlike sense of wonder. I'll have to dig up the note to share with you all one day. It was a whopping six pages of streaming consciousness; a blend of strikingly mature life lessons, balanced out with immature nonsense. Boy, was I long winded (and probably still am haha)! Have you ever considered writing a letter to your future self? I bet you'll be pleasantly surprised, or at least have a few nostalgic laughs on your own behalf... give it a try!